If your pup suffers from various joint issues, it is certainly giving both of you a hard time. It is true that you can do little or nothing to fight the genetic causes of these conditions. But did you know that the right type of diet can help alleviate the main symptoms considerably and preserve healthy joints? Let us tell you more about this in a minute. As we have already said, there are several factors which make dogs prone to developing these orthopedic problems. Inadequate food, in terms of both amounts and ingredients, can be responsible for the malformation and bad functioning of joints. Although larger and giant breeds are more likely to face these problems at one point in their lives, any dog can actually experience the unsettling symptoms of joint-related disorders. So, what is the role of food and what types have proved to be the best options in dealing with joint issues? The answer is just around the corner. It only takes three weeks to see the first benefits of this superb formula. It is primarily aimed at improving the joint mobility in your canine. Hill’s Prescription Diet provides all the necessary components which have proved to be effective in achieving this goal. Relevant clinical studies make the basis for the most optimal selection of ingredients for the maximum effect. The underlying philosophy of the creators of Hill’s Prescription Diet revolves around the belief that the combination of proper nutrition and healthy weight play a vital role in maintaining joint health. For this reason, the calorie density of this blend is strictly controlled. By feeding this food to your furry friend, he is likely to have a lean, muscular body, which will not put too much pressure on the skeletal system. Valuable components such as L-carnitine, Omega 3 Fatty Acids, Glucosamine, and Chondroitin sulfate are present in optimal amounts. If prescribed by your vet, this outstanding formula will result in the improved levels of mobility, flexibility and a more active and pain-free lifestyle of your furry companion overall. This protein-based formula ensures sufficient levels of energy for your growing pet. Carbohydrates make only 35% of the total blend, while protein comes from several different meat sources. Beef, chicken and pork meals are combined to provide a perfect balance of amino acids. In this way, your pup is likely to develop a muscular body, without packing on excessive pounds. Adequate levels of Omega 3 and 6 Fatty Acids, in combination with Glucosamine and Chondroitin, take care of your pup’s joints, ensuring their proper functioning and long-lasting health. Healthy skin and shiny-looking coat will be another positive result of this quality blend. High contents of animal protein sustain the development of your canine’s healthy body, fueling it with the energy needed for daily activities. Vitamins and minerals included in this savory blend boost the immunity and enhance metabolic processes. This formula contains no common allergens, such as corn, soy, and wheat, making it safe and easily digestible for your pup. All things considered, Victor Performance is bound to supply healthy nutrition with high levels of energy, taking care of your furry friend’s joints. The manufacturers of this tasty formula opted for healthy chicken as the main source of protein. The chicken is cage-free, with no hormones or steroids added. It promotes a healthy, strong and muscular body by supplying necessary amino acids. It helps the muscles maintain their tone more easily. At the same time, the addition of vitamin E keeps the connective tissues strong. Dogswell formula is rich in Vitamins A and E, bolstering the body defense systems. They have strong antioxidant power, eliminating the harmful free radicals from the body. It contains optimal levels of Glucosamine and Chondroitin, responsible for the proper functioning and flexibility of joints. A variety of real fruits and vegetables provide sufficient levels of fibers, making this formula easy to digest. By eliminating the most common triggers of allergies and food intolerances, it reduces the occurrence of these problems to a minimum. By choosing Dogswell, one thing is clear – you are making a wise and responsible choice, wishing your furry friend well. Arthritis in your canine generates a number of issues you have to deal with. The makers of Purina Pro Plan Veterinary Diets put a lot of effort into helping you resolve some of the problems your pet is facing. Its carefully selected and precise formulation addresses the needs of canines suffering from this painful and irritating orthopedic issue. This high-quality specialized blend aims to support a well-balanced diet. This results in a healthy, fat-free body of your furry friend. This is why protein stands at the center of its combination of ingredients. It keeps the calorie density at optimal levels, too. This nutritious blend puts particular emphasis on preserving the healthy cartilage in your pup’s joints. This is of particular importance when it comes to aging dogs. Natural Omega 3 Fatty Acids, Glucosamine and EPA are present in abundant levels. Purina Pro Plan Veterinary Diets will make a powerful tool in helping your pup overcome some unpleasant symptoms of this widespread condition. A quick look at the ingredient list of this savory formula is enough to realize how beneficial it is, especially for large and giant dog breeds. It combines quality components, to provide a complete, well-rounded and sound diet for your furry buddy. It will make a supporting pillar in ensuring a strong immune system. Yet, its main target is to sustain a healthy development of bones and joints, preventing the most frequent degenerative diseases. With the addition of New Zealand green mussel, it plays an essential role in keeping the joints functional and healthy. Its powerful antioxidant features help it clean the body, by eliminating toxins and other harmful elements. This veterinary-prescribed formula has the kibble of the suitable size for large dog jaws. It is extremely tasty and palatable, based on easily digestible nutrients. Adequate levels of EPA and DHA maintain joint health. By opting for Royal Canin Veterinary Diet, you will feel confident you are providing your large friend with nothing but the best of quality. The manufacturers of Diamond Naturals dog food formula recognized the importance of proper nutrition for the well-being of large and giant dog breeds. 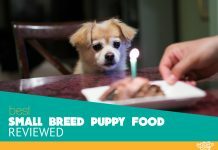 For this reason, they combined the highest quality ingredients, to ensure well-rounded nutrition for your furry friend. Real lamb, whole grain brown rice and plenty of fruits and veggies account for the quality of this savory food blend. Real lamb protein known for its benefits, sustains the development of a strong body. Its optimal complex of vitamins and minerals, with powerful antioxidant qualities, help your pup’s body stand against diseases. Omega 3 and 6 Fatty Acids nurture your furry friend’s skin and coat, giving them a glossy look. Your pet will find it easy to digest, due to its blend of probiotics. It minimizes the occurrence of allergies and intolerances, by ruling out common allergens and artificial ingredients. There is no doubt – by choosing Diamond Naturals, you are choosing a real jewel in the world of canine food formulas. 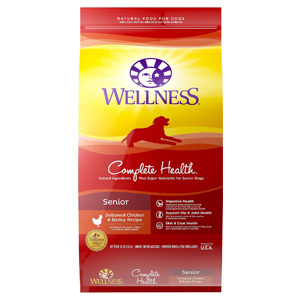 Wellness Complete takes a serious approach to your senior pup’s nutrition. It takes into consideration all the aspects of the health of an aging pup, tailoring this delicious formula to these specific needs. Your senior canine will crave its fresh and savory taste, obtained from juicy fruits and veggies. Deboned chicken makes the main source of healthy protein in this blend. Supported by healthy carrots, spinach, apples, and blueberries, it creates a superb nutritive blend, which will keep your pal happy and content. Glucosamine and Chondroitin included in this formula are responsible for maintaining mobility and general health of your pet’s joints. Taurine keeps the hearth functional and strong. Extracts of green tea feature their antioxidant power, cleaning the body effectively. The lack of corn, soy, artificial flavors or colors makes this formula safe for pups with stomach sensitivities. Your furry companion will enjoy his senior days indulging in this tasty but above all beneficial canine formula. Early stages of a pup’s life are the period when first predispositions for orthopedic disorders develop. Excessive weight is among the most common preconditions. Your puppy will soon pack on extra pounds as a result of food which is too dense in calories or served in large amounts. The skeleton of a fast-growing, chubby pup will not be able to support its body properly. This will, at one point in adult life, reflect through damaged, weakened or even painful joints. Careful management of your pet’s nutrition plays a key role in preventing such problems from day one. Arthritis is likely to affect about 20% of dogs as they reach maturity or old age. By this stage in your pet’s life, the joints get worn out and your furry friend starts to show symptoms of this degenerative ailment. It will in most cases grow into a chronic condition, with a number of distinctive signals your pup may send you over time. Difficult movements and standing up, stiffness, lameness, swelling, and pain usually result in an overall lethargic mood. Careful selection of the dog food for arthritis can bring about considerable relief to your buddy. It is not unusual for these types of injuries to happen during everyday activities such as running, energetic playing or bouncing. Some more severe ones may be the result of getting hit by a car. They are typically easy to spot. If an injury affects any of the elements of or around a joint (bones, cartilage, ligaments, tendons, etc), it will cause pain, swelling, immobility or even a fracture. Some of these will heal on their own after some time, whereas others may call for complicated surgical procedures. The speed at which your puppy grows will make the difference in whether he is likely to develop this type of dysplasia. The bones in malformed hip joints, which are not strong enough to support a rapidly- growing heavy body wear out, rub and create friction. This, in turn, leads to uneven and limited movement of a hip. It will show several symptoms, and if you do not address it properly, will eventually turn to chronic arthritis. It may take some time to diagnose a canine with elbow dysplasia. This condition results from several factors, such as genetic predisposition, diet, excessive growth or trauma. The growth of the bones in front leg joints is not synchronized. This creates a mismatch between the bones size and the movement of the joint is not smooth. Inflammation processes, inability to walk or exercise for a long time, swelling and pain, are some of the symptoms owners may recognize in their furry friends, usually of large and giant breeds. The so-called OCD is a condition in which the cartilage surrounding the bones in joints grows abnormally. Depending on the severity of this disorder, a crack in the cartilage can form or small fragments break off, floating inside a joint. The most serious instances include complete detaching from a bone. It is, except for genetic predisposition, caused by excessive intake of calories and calcium in medium and large dogs. Affected limbs become lame, painful and swollen, restricting your pup’s ability to move and function normally. While still in the womb, some dogs contract viruses that have a harmful effect on their later development. These viruses affect the formation of the skeletal and muscular systems. They usually result in a number of different conditions in joints, bones, and muscles. These include deformities, malformations, dysplasias of joints, too fragile and underdeveloped bones. In more severe cases, these conditions deteriorate significantly the quality of your canine’s life. We refer to metabolism as a series of processes which occur in the body. Metabolic processes break down complex food ingredients into simple nutrients and energy. If they slow down or are inefficient, this can seriously hamper some body functions. If the metabolism of calcium does not work properly, the body retains high levels of this mineral in the blood. This usually leads to different problems with the skeletal system. Bone cancer, or osteosarcoma, affects in most cases large and giant breed older dogs. It is a serious and painful condition that will reflect negatively on the quality of your pet’s life. Unfortunately, there is no definite cure for this condition, although certain treatment procedures can result in some relief. Joint diseases in canines manifest through a number of symptoms. As soon as the owner recognizes the existence of one or several of these indicators, they need to take swift action in order to deal with it efficiently. Joint issues in dogs almost always include the stiffness of the affected leg. It is most obvious after the period of resting or sleeping. Your pup will find it difficult to walk, run or use the stairs, showing the limited mobility of the leg. One of the obvious signs that something is wrong with your pup’s bones or joints is limping. It can be a short-lasting condition, but sometimes it persists for a long time and indicates a more serious issue. Limping typically results from inflammations, sprains, fractures, and chronic osteoarthritis. It can manifest periodically, after periods of normal walking. Owners should try to evaluate the severity and nature of this problem. They should take the necessary steps to determine the cause and provide adequate treatment. When a canine is not able to use one of its limbs normally, we refer to this condition as lameness. It usually follows an injury or some other source of pain and can be both acute and chronical. Lameness can occur in pups regardless of their life stage or breed, where the causes can be various. In young puppies, it is typically an injury or growth abnormality that causes it. Adult and senior dogs develop it as a result of an injury, arthritis, degenerative joint disease, hip dysplasia or it is of unknown origin. Owners may sometimes notice that their furry friend favors a limb and does not walk and move in a typical way. This normally indicates the existence of an orthopedic problem. Your pup may be reluctant to bear weight on the affected leg, either completely or to some extent. They usually bend a leg without leaning on it fully. Limping is typically present, as well. An x-ray scan can reveal the cause of this condition. Sometimes it may be necessary to carry out additional tests, too. If a joint or any other skeletal issue exists in your canine’s limbs, he will probably move with difficulty. Depending on the severity of the condition, the movement will be more or less limited. Unhealthy joints do not move properly and are usually accompanied by pain. This means your furry friend may find it rather hard to participate in daily activities such as taking walks or exercising. Limited mobility can be particularly obvious after periods of inactivity or rest. Your buddy may be reluctant to use the stairs or jump on and off elevated surfaces (chairs, sofas, etc.). One thing is definite – it can drastically deteriorate the quality of your pet’s life. Glucosamine is a substance found in a dog’s body, particularly in the cartilage. It is responsible for maintaining the joints healthy and mobile. If the levels of glucosamine drop, usually as a result of aging or excessive growth, a number of joint issues are likely to develop. These include inflammation processes, reduced mobility, stiffness, pain and eventually arthritis. Chondroitin plays a similar role. In combination with sufficient levels of glucosamine, it contributes to the proper functioning of joints. If your pup’s body fails to produce this substance in the necessary amount, supplementation is advisable. Types of food which contain adequate levels of these two elements certainly make a wise choice for both aging and pets suffering from various joint issues. This chemical is naturally contained in the body and has several functions. Besides its beneficial effect on the liver and nervous system, it can be useful in dealing with joint problems as well. It helps reduce inflammatory processes, resulting in increased flexibility and mobility. At the same time, it supports the rebuilding of the cartilage, which in turn has a positive outcome in the cases of osteoarthritis. For these reasons, the optimal contents of this component in dog food formulas are certainly beneficial. This unusual type of mussels native to New Zealand is known for its beneficial effect in dealing with joint issues in dogs. Extremely rich in Omega 3 fatty acids and similar lipid components, they stop inflammatory processes typical in arthritis. By blocking the inflammatory enzymes, they support the recovery processes. Moreover, they are safer for your canine’s stomach than most medication used to treat joint conditions. The positive impact of Omega 3 fatty acids is well-known in the case of osteoarthritis in canines. If you supplement them properly over a period of time, these acids soothe inflammatory processes and increase mobility. The richest source of this type of fatty acids is fish oil and salmon oil. Hence, foods rich in these types of nutrients present a good choice. This compound contains sulfur, one of the essential elements for the normal functioning of the body. Its role is significant in reducing pain. It is also effective in dealing with autoimmune diseases in your canine, osteoarthritis being one of them. It neutralizes the effects of inflammation, serving as a strong antioxidant as well. Extracted from cow’s milk, duralactin contains concentrated protein which has proved useful in dealing with degenerative joint diseases. It can be added to your pet’s diet to assist in reducing inflammatory processes affecting joints, hips, and elbows. Unless your pup is lactose-intolerant, it is safe and causes no side-effects. Obtained from protein-rich ingredients such as fish, chicken, and beef, creatine supports strong muscles in your canine. In the cases of its deficiency, muscle loss usually occurs, leading to joint damage. To reverse this process, providing sufficient sources of creatine is essential. This is especially the case with aging dogs. Advantages of vitamin C in the canine diet are numerous. It supports the overall health, by strengthening the immunity. Its antioxidant features make it effective in eliminating toxins from the body. Obtained from fresh fruits and vegetables, it maintains the collagen levels, playing a big role in addressing issues related to the skeletal system. It is a familiar fact that different breeds of dogs are more or less prone to developing certain health issues. Although joint issues are usually associated with large and giant breeds, it is not uncommon to find small and medium-sized dogs suffering the same types of symptoms. Unsuitable nutrition is often one of the main reasons why canines face these types of problems. It can be the cause of obesity or result in a skeletal system which fails to develop properly. Owners should be well aware of all these factors. They should use them as the starting point in selecting the proper type of food. Skeletal issues in pups usually become obvious in later stages of life. However, this does not mean that owners should not take proper care and prevent the occurrence of such issues from day one. The right type of food formula is usually a decisive factor in promoting healthy joints in pups. It sustains optimal development and strength of bones, joints, ligaments, and tendons, keeping them healthy and functional. You can only achieve this if you feed your furry friend with specially made, age-appropriate formulas which provide a good balance of all the vital nutrients. There is a vast array of supplements aimed at maintaining the health of your canine’s joints. Levels of their effectiveness vary, but overall they can be quite useful in keeping your pet mobile and active. Although they can bring significant relief, you should not expect them to be the cure for most common skeletal issues. By introducing them timely in your canine’s diet, you may considerably reduce the risk of the disease occurrence. These supplements typically include components such as glucosamine, chondroitin, and MSM. The risk of side-effects is very low unless your pup develops some digestive difficulties. Consultation with your vet is always recommended before introducing any kind of specialized food supplements. Are there homemade food recipes that are good for the joints? Ingredients used in homemade food for your pup dealing with arthritis should be the ones with anti-inflammatory features. The recommended recipes usually include chicken, oats, carrots, celery, flaxseed and coconut oil. These provide omega fatty acids, beneficial for such skeletal conditions. It is wise to avoid things such as fatty meat, grains, potatoes, pepper, tomatoes, and eggplants. These are known to aggravate the symptoms. Are there non-prescription medicines that are safe to give? No owner will find it easy to watch their pet in pain. Yet, making a decision on what to give your pup to relieve it is a serious matter. Over-the-counter medication may sound like the most tempting and practical option. However, it carries a number of risks. Human medication given to dogs can sometimes cause even more serious problems. They include digestive issues, kidney failure, bleeding disorders, etc. To avoid this, always try to seek your vet’s assistance in addressing the cases when medication is needed. What are home remedies for pain relief? You have probably explored medical treatments and followed your vet’s advice to reduce the pain in your furry friend’s joints. What is left to try are some common home remedies. Make sure your pup’s bed is warm, soft and cushions the movement efficiently. Massaging the muscle area around painful joints is likely to bring instant relief. Moreover, warm pads placed on affected parts of the body will make the pup feel less pain. In addition to a diet rich in omega 3 fatty acids, chondroitin and glucosamine, make sure the amount of exercise and activity is properly managed. Enjoying long hours of walks, playing and activity alongside your furry friend is probably every pet parent’s dream. Unfortunately, the reality is often different. Joint issues are among the most common and serious obstacles to your pup’s happy and pain-free life. Although it is not possible to influence the genetic predisposition or turn back time in case of your senior canine, your hands are not completely tied. The key to improving the quality of life of your pooch with skeletal issues lies in proper nutrition. There is no doubt that Hill’s Prescription Diet is one of the best examples of how to reach this target efficiently. Each owner should seriously and thoroughly consider the best feeding options for their dog. By doing so, they stand good chances of preventing the incidence of joint problems in your aging pets. At the same time, they will support the overall wellbeing of their furry buddies.